a living doing something I enjoy. I have owned and operated my Taxidermy Studio (view shop) in the beautiful Brainerd Lakes area of Minnesota (Minnesota map) for over 20 years. I have a 4 year Bachelor of Science degree in Industrial Arts Education, with an emphasis in Art Composition. I am privileged to be able to combine my formal education with my love of taxidermy. I continue to strive for excellence in all steps of the art and have won many World, National, and State Awards. Let me help you develop your own individual artistic visions and turn them into a rewarding career. your desire to learn taxidermy, or perhaps you are looking for a career change, we will help you achieve your goals in this exciting profession. Our objective at North American School of Taxidermy is to give each student the skills required to start their own Taxidermy Studio. Let us help you begin a new future in this artistic and rewarding profession. 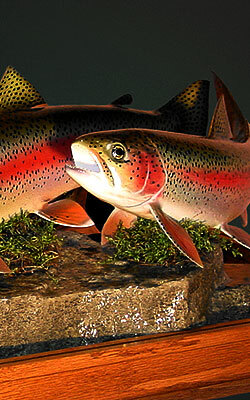 We teach the skills required to set your taxidermy business apart from others. As you read through the following pages, I hope you will allow me to give you the confidence to pursue your dreams.